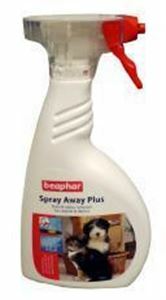 Removes stains and odours biologically. And they don't come back! Contains cleaning agents and special bacteria which love to eat up organic stains and odour-producing substances, both of which pets are apt to produce. Once the stain has been removed, the bacteria die. So smells are tuely removed, and don't come back later, when perfumes wear off, as may happen with many other cleaning products. Also excellent for removing grass, red wine and food stains.